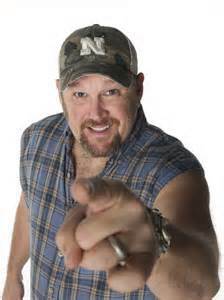 Larry the Cable Guy was born on February 17, 1963 in Pawnee City, Nebraska, as Daniel Lawrence Whitney. He is an actor and producer, known for Cars (2006), Cars 2 (2011) and Blue Collar Comedy Tour: The Movie (2003). Whitney has released seven comedy albums and his catchphrase: “Git-R-Done!” is also the title of his book.